Matches. They’ve been helping people easily create fire since the early 1800s. Yet, they seem to have fallen out of popularity in recent years. Where they once were given away for free by restaurants, bars, and businesses, you now almost have to purposely track them down in your local mega-store aisle. Granted, matches aren’t cool like butane jet lighters, ferro rods, Zippos, or the practically-ubiquitious Bic. But they are reliable and fool proof, barring just one issue… getting wet. Today’s writeup takes a look at a few different types of matches and ways to store them. Survival experts strongly recommend having multiple ways to start a fire. In the event of an emergency, your gear might become damaged, lost, or simply run out of fuel. And whenever possible, you should layer your fire-starting gear so that you always will have a way to generate flame on hand. Matches make a great addition to your survival kit, and even your daily EDC (every day carry). They are cheap, easy to use, and lightweight. One candidate for match duty is the strike-anywhere variety. On the plus side, you can strike them anywhere. The downside is, well, the same… you can strike them anywhere. It wouldn’t hurt to protect them from movement in your container or kit just to be cautious. The next variety are the strike-on-box type (aka safety matches). These require a phosphorus strip on the box or packaging in order to ignite the match. A little safer to store in transit, but keep the striker strip stored separately from the matches, or even wrapped up (baggie, aluminum foil, etc.). Lastly, we come to the all-weather or “waterproof” matches. There are several different manufacturers out there, but the general idea is the same. 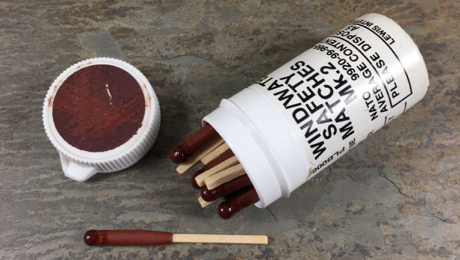 The match is coated in chemicals to both extend the burn time and resist the elements of Mother Nature. Similar to safety matches, these require a phosphorus strip to ignite (again, store it separately). These style of matches are a little more expensive, but are probably the best pick for a survival kit or bug out bag. Once you’ve got the type of match you want to carry picked out, the next step is making sure they stay warm and dry. Some of the all-weather matches will come as a complete kit with a handy match case included. Yet others will just come in a cardboard box, requiring you to come up with your own container. You can go fancy, as shown in the photo below, and find a metal match case that works for you (L to R): K&M Aluminum Match Case, Triple Aught Design Life Capsule Omega, and the Exotac Matchcap.